Featuring over 70 of Houston's most colorful and vibrant walls, “More Color, Please : The Walls of Houston” is a hardcover coffee table book that will brighten up any coffee table in your home. Alongside each wall, you'll find an inspirational and colorful quote. This beautiful hard cover 10x13" book is filled with over 150 pages of color, positivity, and happiness. Ten percent of proceeds from the book will benefit Hurricane Harvey relief efforts. This incredibly soft and super cozy sweatshirt is printed with our “more color, please” slogan in black and multi-color, and you’ll live in it all year long. Featuring a wider neck that allows it to be worn as an off the shoulder look, it is as stylish as it is comfortable. You won’t want to take off this soft and comfortable t-shirt. The grey tai-blend More Color, Please short sleeve crew-neck t-shirt is one you’ll wear all the time. Paired with denim, skirts, and leggings, it’s extremely versatile. This short sleeve onesie has a three snap leg closure to allow for easy changes throughout the day. 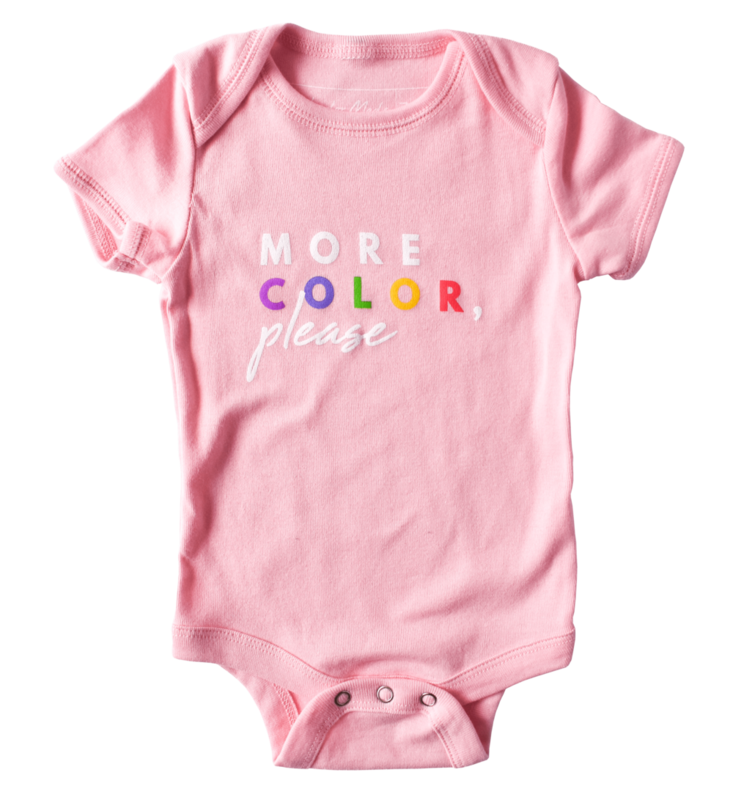 Your little one will look pretty in pink in our signature onesie. Select size 3-6 mo.6-12 mo.12-18 mo. In honor of the launch of the Carrie Colbert brand, Carrie is thrilled to partner with famed artist and illustrator Inslee Farris to create this limited edition colorful fashion illustration. This 8x10 inch illustrated print is based upon a photo of Carrie strolling New York City’s fashionable and trendy Soho neighborhood. Printed on heavy ultrasmooth fine art paper with beautiful color clarity, each unframed print is signed by the artist. Act fast, as only 20 of these limited edition prints are available!